Illustration by Greg Crane of November 1993 Kitchener fly-over of a yellow “meteorite” that curved and then appeared to release nine, black triangular shapes without fuselages in aerial formation silhouetted against the 11 PM Ontario, Canada, sky. Toronto, Ontario, Canada (upper right red circle) is on Lake Ontario. 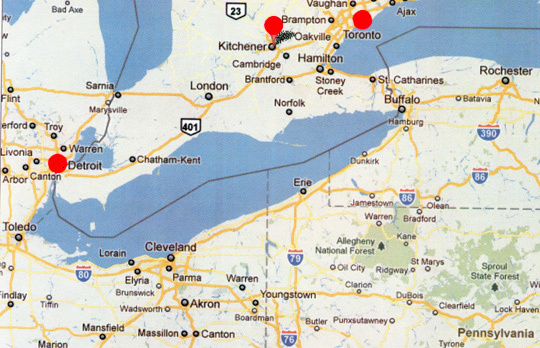 Kitchener (middle red circle) is 57 miles (92 km) southwest of Toronto with a population of about 205,000, the fifth largest city in Ontario. Straight south is Lake Erie that also borders western New York and Pennsylvania, northern Ohio, and eastern Michigan (left red circle at Detroit). January 5, 2012 Kitchener, Ontario, Canada - Greg Crane sent me a photograph of his Kodak Easyshare camera attached to his telescope - both on tripods at his Kitchener, Ontario, Canada, home.